Live music returns to Resonance FM every Saturday lunchtime with The Hello GoodBye Show. Featuring; London based jazz quintet Entropi. Kyoto based abstract pop duo Viva Sherry. New York based musician and author Ben Arthur. Plus, a pre-recorded live session & interview with with Paris based, folk-pop artist This Is The Kit. 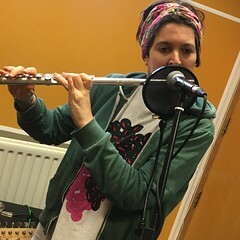 This entry was posted in dexter bentley, hello goodbye show, Hello GoodBye Show: Listings Info, resonance fm and tagged ben arthur, dee byrne, dexter bentley, Entropi, hello goodbye show, live, london, music, radio, resonance fm, this is the kit, viva sherry. Bookmark the permalink. Thank you so much for having Viva Sherry on the show! They are based in Kyoto, by the way.